I am a little obsessed with pesto at the moment and want to make pesto everything. Pesto is a sauce hailing from Italy. It traditionally consists of crushed garlic, pine nuts, salt, basil leaves, parmesan cheese and olive oil all blended together to make a sauce of the God’s! Many people’s experience of pesto will be shop bought in a jar, but once you start making your own there is no going back! Also when I say “Pesto” I am stretching the truth a little, all I mean is green things blitzed up with garlic, citrus, nuts, salt, pepper and an optional cheese. At my pop up restaurant at Gray’s Larder I gave all my guests a little pot of Cavolo Nero “Pesto” to take home and experiment with, but you can make it out of anything green and tasty. De stalk the cavolo nero and chop. Put into a blender with all the other ingredients, pulse until fully combined. You can make “pesto” out of pretty much any leafy green. They are so simple to make and will give any dish a fantastic lift. Pumpkin & Sesame Seeds. I know these are not nuts but really tasted and so good for you. Simply whizz up your chosen green leaf with lemon juice (you can also use any other citrus, coriander and orange go so well spooned over pork chops) nuts of your choice, garlic, salt , pepper & olive oil. If you want to add cheese you can. You can then store your pesto in the fridge for up to a week. Be classic and stir it through pasta, nothing quite beats pesto pasta when the pesto is home made and full of flavour. Toss it through roasted root vegetables and serve with a big green salad, adds so much zing and makes the vegetables sing. Spread it on toast and serve it with avocado & grated carrot as a super quick and tasty lunch. Homemade chicken kievs stuffed with soft cheese and covered in pesto breadcrumbs. A total comfort meal for me this one! I love using black pepper boursin cheese to stuff the kiev with and then stir the pesto though breadcrumbs to cover the kiev. 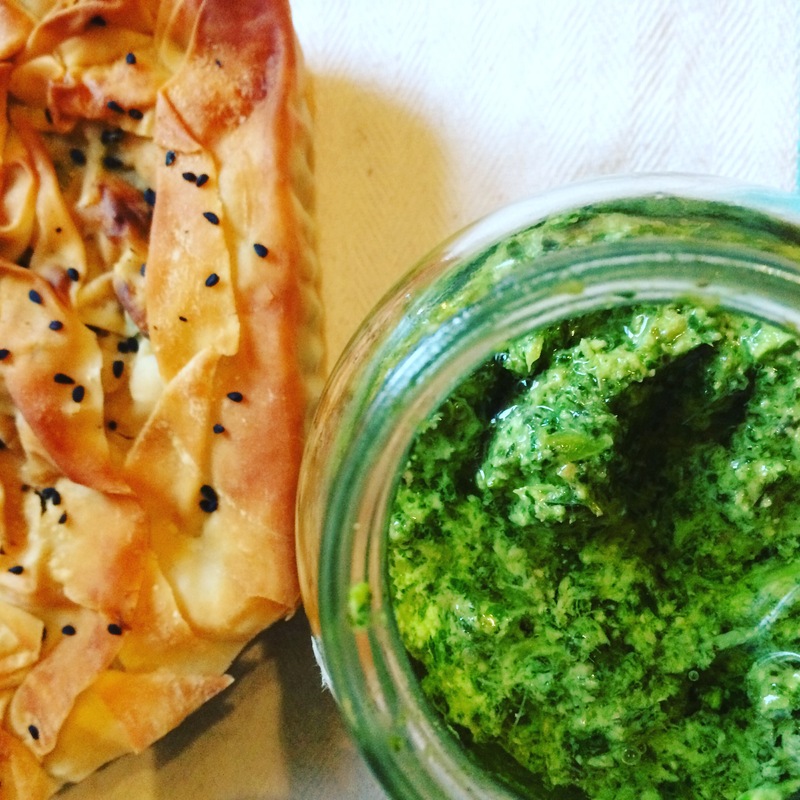 Pesto is easy to make and will last up to a week in the fridge, so whatever you decide to make your pesto with, give making it a go! Want to see what other food I can create for you? Take a look at my sample menus or get in touch for more information about creating delicious food. Don’t want to miss out of Taste the Love events?